Scoff all you want at the irrelevance of the Oscars or any number of award ceremonies the fact remains that the Oscars are a big deal – studios spend millions of their hard earned money on “for your consideration” adverts in trade magazine in hopes that one of theirs will win the coveted golden man and they will get to use “academy award winner actor/director” in their playbill for all eternity. An “academy award winner/nominee” tag breeds instant credibility and lends weight to how interested a casual viewer would be in deciding on which movie to spend their money on. Oscars often is an incredible platform for the culmination of a long career being honoured with a standing ovation or the start of a great one when an ingénue stumbles her way up the stairs to collect the gold piping the veterans to the finishing line. It is also one big party with plenty of pageantry and for all these reasons and more I for one always eagerly anticipate the Oscars each year even in the year that was less than spectacular movie-wise. Last year I had an incredible 21/22 prediction of the Oscar race which would have made me a rich man if I was the betting sorts. But this year I am not so sure of putting my money because the list of nominees is a strange one and I have a feeling that a number of the deserving winners are going to be passed up I favour of those that are more closely aligned with the overall taste of the general academy members demographic Old-White-Male. Who should/Will win: This one is a vice-like lock – it is Patricia Arquette in Boyhood. It takes an incredible amount of commitment to be associated to a project for 12 years with no real payoff in sight. Patricia Arquette as the mother in this family drama about growing up is incredible in her strength, her vulnerability and her normalness. She is every mother everywhere going through everyday struggles. It takes special talent to portray a real everyday woman on screen and she does it better than anyone else. Her not winning would be a real shame because dedicated as I am to worshiping Meryl Streep (and she was incredible in Into the Woods) I want Arquette to win over Streep. Who should/Will win: J.K. Simmons as the jazz teacher from hell in the incredibly taut Whiplash is a clear winner here. You will shudder at the thought of the atrocities he makes the young Milles Teller go through. The only possible upset could be in the form of Robert Duvall who the academy might want to pay their dues to before it is too late. But my money is on Simmons. This is a strange one – generally there is a strong Pixar presence and despite the presence of Big Hero 6 I find it hard to believe it could realistically win the award. I loved HTTYD the first one and that was robbed of an award that went to Toy Story 3 the second one while solid didn’t have the heart that the first one did. And when Pixar and DreamWorks cannot be picked a clear winner it is usually one of the foreign studios who sneaks a win. I would still like to see HTTYD2 win as a consolation for the first feature snub. It is a crying shame that Hoyte Van Hoytema who manned the camera for Nolan’s Interstellar does not find a mention here. For all its faults Interstellar was visually the most incredible movie this year and he deserved not only a nomination but also a win for the incredible visuals. Who should win: Robert Yeoman – for the incredible whimsy and energy he infused on screen to complement the story by Wes Anderson in The Grand Budapest Hotel. He has shot each of the Anderson movie with the exception of Fantastic Mr Fox and their partnership has been incredible. Who Will Win: Emmanuel Lubezki for Birdman for those beautifully crafted shots that intertwined the different spaces back and front of the stage in the claustrophobic space of the theatre. Lubezki managed to fill the screen with dynamic visuals without ever crowding the space. And with the love that the academy seems to be having for Birdman I am pretty sure Lubezki will be going for Gold number 2 a year after he won for Gravity. Who Should/Will Win: Interstellar – there shouldn’t even be any discussion about this. To take what is essentially a life’s work in theoretical physics based on the concepts of worm hole, time travel and singularity among other scientific concepts and to turn it into petabytes of data based on 4-whiteboard-long equations and to turn that into stunning visuals is an incredible achievement that cannot be ignored. Who Should/Will Win: I loved Finding Vivian Maier and found it to be incredibly moving but in CitizenFour we have something incredible – one man’s courageous/traitorous action to expose a nation’s overreach in the name of national security and the an incredible tale showing the importance of the fourth estate of democracy – that of Journalism. CitizenFour should in all likelihood but who knows if the bureaucracy can strong arm a notoriously spineless academy. With many acts of anti-Semitism happening around the world and the fact that it also got nominated for best cinematography bodes really well for Ida – a story of a young nun about to take her vows who discovers a terrible family secret. But I have also heard fantastic things about Leviathan as well. But seeing as how America feels politically about Russia I am willing to bet that Ida from Poland will take home the gold. Now up until this year these categories used to baffle me – what the hell is the difference – then upon doing some basic research I found an apt analogy sound editing is analogous to picking the right ingredients for the dish while sound mixing is the actual cooking bit. It is particularly important with most movies being released in multiple formats including IMAX where the immersive sound requirement need the cooking to be done at a different pressure. So with that being clarified what we are looking for is the movie that had the best sonic ingredients and the one that presented the best dish. Sound Editing: Interstellar should but American Sniper most like will. Sound Mixing: Whiplash should but Birdman most likely will. Of all the times that Zimmer should have won he wasn’t even nominated and to think that he got nominated for Interstellar is some sort of an internal academy joke. His background score for the inter-galactic adventure was the second worst thing about the movie only to be topped by Matthew McConaughey. Who Should Win: Johann Johannsson for Theory of everything. Who Will Win: Alexandre Desplat probably for The Imitation Game. After Happy and Let it go from last year this year is an abysmal showing of songs that are not necessarily that memorable. Academy might want to pay homage to a fading music legend in the form Glen Campbell or probably recognize the civil rights drama Selma which has been shut out from so many other major categories. I would be happy for either Whiplash or Boyhood to win this – one for a tautly edited movie that does not relent the pace until the very last minute and delivers one hell of story and the other for seamlessly editing 12 years’ worth of footage without the need for subtitling which year we are in. my money though is on Boyhood. After being shut out the best director category it is only justified that Damien Chazelle should win for Whiplash. Or even Anthony McCarten for the brilliantly uplifting The Theory of Everything. But I have a Feeling Graham Moore’s sub-par adaptation will take home the little shiny man. With the exception of Foxcatcher we have 4 exceptionally original and entertaining screenplays 2 of which are my absolute favourites. It would be a true crowning for Richard Linklater who has given us such modern masterpieces as The Before Trilogy and the most recent Boyhood. To take everyday existence and to elevate to the level of art is what cinematic excellence should be about. Dan Gilroy’s Nightcrawler is also absolutely brilliant in its intensity and the honesty with which the characters are written. There is no redeeming quality to be found in Gilroy’s Lou Bloom and I would love an upset win for Nightcrawler but it is unlikely to happen. More likely that Iñárritu and his team will pip Linklater to the post. I love Miller’s previous works but swap him out for Theory of Everything’s Marsh or Whiplash’s Chazelle and I would be a happier man. But life isn’t fair and Linklater will probably not win but Iñárritu will. Linklater’s achievement cannot find any parallels – for a director to invest 12 years of his life and to get the same commitment from his actors to tell a simple tale of a boy coming of age is courageous to say the least. In comparison Inarritu’s masterful telling of a struggle of an actor trying to silence the demons in his head and master his craft while not entirely original is still a glorious triumph. I would like Linklater to win for all the times that he wasn’t even nominated for his Before series but I wouldn’t be too upset if Iñárritu won. But I do miss Fincher not being nominated for Gone Girl. For me it is a two-horse race between the Academy favourite Michael Keaton who fits the bill of Old-White-Male perfectly but what Eddie Redmayne achieves in Theory of Everything is incredible. Portraying living legend Stephen Hawking Redmayne manages to infuse the humour that is trademark Hawking – he does not just act like hawking he becomes hawking , gait, humour and the shrinking body and everything. In what is possibly the weakest assemblage of performances by a lead this category inspires very little confidence. Felicity Jones was brilliant as Hawking’s long-suffering wife but in a way her performance isn’t showy enough – it is subtle and it is perfect but Academy generally does not go for that sort of thing. Rosamund Pike in Gone Girl was brilliant but I don’t think it is meaty enough for her to score a win. I think this one will go to Julianne Moore as she plays an academician going through Alzheimer’s. Moore is always brilliant in everything she does and here backed with an emotional story it is a sure fire lock for the best actress nod. It is again a two horse race for me – both quality pictures just different in their scope. Inarritu’s birdman is the more Academy friendly of the two subjects as it deals with the world of blockbuster movies, actors, theatre and the pursuit of honing their craft and with a tight screenplay and cracking performances it is a worthy contender. Then there is the crowning achievement of Richard Linklater which is the critics and fan darling and the one everyone wants to win but who knows how the academy decides. There are reports that there are voices within the academy that fails to see art in what boyhood achieves as it is very realistic and very normal – the fact that it took 12 years to make and it flips the concept of epic and generational film on its head it art enough. It would be a very brave move from the academy and a validation of its relevance if Boyhood does indeed win. There is an outside chance that Harvey Weinstein sneaks in surprise with The Imitation Games which is not a bad movie by any regards but not worthy of a win. Come 22nd February and we will see. Let me know what you think about my picks and if you agree or disagree and what are your predictions for Film industries big night! Bring on the Oscars 2015!!! 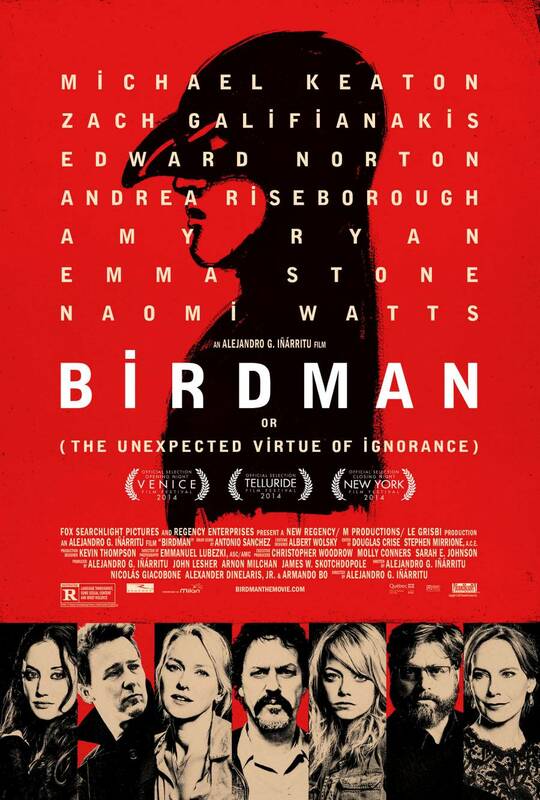 Alejandro Inarritu directs Michael Keaton, Emma Stone, Edward Norton and Naomi Watts in Birdman or The unexpected virtue of ignorance set in the world of New York’s Broadway theatre and tells the story of a washed up actor in a Mise en abyme setting. Riggan Thompson played by Michael Keaton is a once-famous actor known for his starring role as the Birdman-the superhero in 3 movies. Long gone are the days of box office successes and adoring masses and Riggan finds himself irrelevant and artistically unsatisfied and decides to adapt a well-known and much respected playwright’s show for Broadway which needs him to find a suitable actor to fill the playbill after the current actor is injured in an accident while on set which Riggan believes was caused by him. In walks Edward Norton’s Mike a much loved theatre darling with a raging ego and a surety in his craft which seems to threaten Riggan. What enfolds is the backstage and preview shenanigans as Riggan tries to put together a show which a part of him says will resurrect him in the world of performing arts while the other voice nags at the back of his head. The cast is supported by Naomi Watts who plays Mike’s wife/partner and Andrea Riseborough who plays Laura Riggan’s girlfriend and co-actor. Emma Stone plays Sam, Riggan’s daughter and Zack Galifianakis who plays Jake Riggan’s lawyer and backer of the show, these two play a very understated but crucial supporting role which keeps this story moving forwards. I had a major challenge with Innaritu’s Babel and found it to be an incoherent mess with a background score that was at odds with the story telling. Here too Innaritu seems to be working at a schizophrenic pace and creates an atmosphere that is so claustrophobic that it almost becomes too much to bear but then as the story starts taking shape and things start becoming a little clearer you start to appreciate the atmosphere and the almost off-beat drum score which seems to be reflecting Riggan’s state of mind and it comes together in sync only towards the end when Riggan delivers the climax at the end of his opening night. Michael Keaton is brilliant as is Edward Norton, their back and forth and their uninhibited exhibitionist portrayal of the insecurities, the vanities and the delusions that make up an actor is what carries the film. The Birdman alter-ego sequences are a genuine suspension of belief as you question yourself what the hell is actually going on and Innaritu doesn’t dumb it down for the audience to make them realize that Riggan isn’t telekinetic but plain delusional. There is however a problem of pacing as the initial preview pieces take way too long to establish the plot points that they need to and it takes forever for the story to pick up steam, and for a movie under 2 hours it is criminal. But this is easily overcome by the dark humor and the brilliant commentary on the state of the movies today. A number of important arguments are made in the due course of natural conversations between the characters, the most relevant ones are about the cultural genocide where everything is driven by the superhero franchises and the big weekend opening numbers and the conversation that Sam has with Riggan who seems to be holding onto a romantic’s notion of what it means to be culturally relevant and to scoff at social media without understanding the power it provides and the need for its existence. It is here that the movie really succeeds. Emanuel Lubeziski’s work behind the camera is frenetic and filled with the same anxious energy that Riggan seems to possess and it takes you in to the actor’s headspace and the way he utilizes every nook and cranny of the St. James theatre it just opens up the world that exists both front and back of the stage. Watch this movie if you want to get an insight into what drives actors, the big stars and the burnt out ones alike. What it for an incredible and unrelenting 2nd and 3rd act where Michael Keaton, Emma Stone and Edward Norton all shine bright and luminous. Michael Keaton just moved to the top of my list of actors who should take home the gold on 22nd February. Aren’t you bored of the multitude of all the insipid “It’s been a great year thanks for being a part of it” video montages on Facebook already? Was 2014 really that great a year? Is it really worth looking back with nostalgia? For me, personally, it was a defining year – from getting married to moving to a different country but movie-wise it was one of the most lackluster years in history of the blog lifein70mm). When a Christopher Nolan movie doesn’t automatically make its way to the top of my year end list, then it is telling of what sort of a year it has been! But looking back does have its benefits – it can surprise even the most jaded of individuals of that glimmer of happiness that released early on in the year and still sits in a special place in your heart glowing with tiny but incessant warmth. Thanks for staying with lifein70mm and thanks for letting me know that you like my reviews more than some of the most celebrated critics who write for the leading newspapers. It makes me want to see more, and write more and that is all I can ask of you! Boyhood: Richard Linklater defies the boundaries of imagination. Just think about the commitment it would be required to shoot each year over 12 years to document the life of a boy and to tell the simplest of stories of growing up, the dysfunctional American family, and the bonds that tie us together. A movie so unique, that it can only be classified as the space that exists between a coming-of-age tale and a documentary. I have loved Linklater Before series and it is two of my favorite writing, I was really looking forward to reviewing Boyhood and even after watching it twice I am unable to pen down my thoughts on it. To say I loved it would be a gross understatement. Finding Vivian Maier: I love documentaries and the ones that are done well are most often better than fictional stories because you don’t need to imagine that it can happen but marvel that these things did indeed happen. A writer stumbles upon a cache of old photographs from a lot that he bought on a whim at an auction, the photographs are of such high quality and tell such a vivid story of the life in the 60s that the writer is pulled into the intrigue of the artist who took these photographs and he documents his search in this documentary. One of the most beautiful and poignant documentaries I have ever seen and images that will stay with you a lot longer than the duration of the film. Vivian Maier’s rise to posthumous fame is incredible. She even gets a mention in the opening credit of this year’s best comedy on television Selfie alongside Freda Kahlo and her self-portrait. Gone Girl: Nobody does dirty sick and twisted quite like David Fincher. To take what was essentially airport fiction and to turn it into a catharsis of a marriage is laudable feat. This movie features the best use of voiceover I have ever had the pleasure of watching and when done in the breathy voice of the enchanting Rosamund Pike it takes creepy to a whole new level. An enormously enjoyable and infinitely rewatchable movie with one of the best soundtrack this year. Haider: Vishal Bharadwaj, Shahid Kapur and Shakespeare’s Hamlet are a potent combination. Setting the movie in Kashmir should have been a staggering achievement in storytelling, but by wavering on taking a stand, Bharadwaj ends up with a technically beautiful and intensely acted movie which stumbles a little with its plot. This could have easily ended up as a disappointment for me had it not been for Shahid Kapur and Tabu. I accord this movie half a spot on the top 10 to be shared with a movie down the list. Kick: I know there will be many of you who will be shaking your head in dismay at the inclusion of this movie in this list. 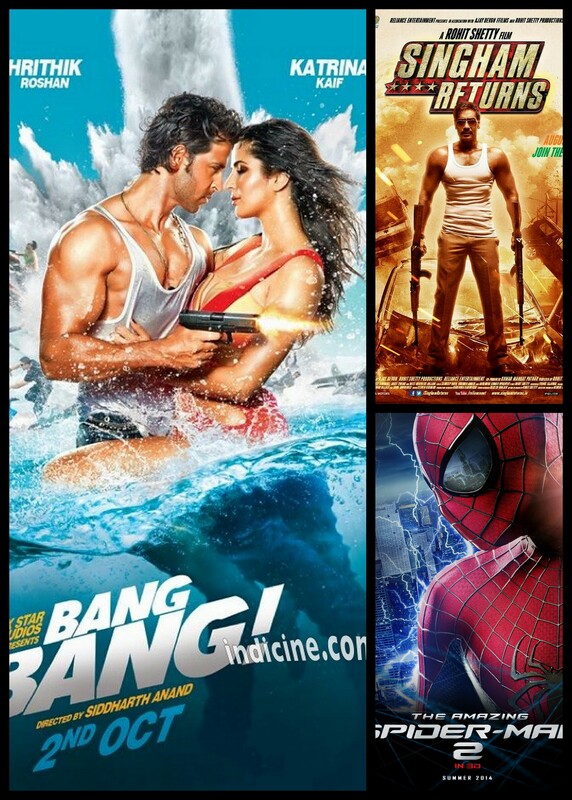 But this was the only 100 Cr movies this year that had any modicum of entertainment value. It takes the histrionics of Salman to make nonsensical an art form. With the gorgeous Jacqueline Fernandez by his side the king khan takes us on an adrenaline rush that was unmatched this year. Mardaani : I dislike Rani Mukherjee with a passion that is only matched by my dislike of Aamir Khan but in Pradeep Sirkar’s able hands Rani turns in what is one of the best performances of her life. A skillfully crafter thriller with a very unusual and non-stereotypical antagonist, a movie with a message which it delivers masterfully without hammering it on your head; this was the perfect example of a movie which India needs. If ever there was a need for sequels then this is a movie that richly deserves it. Nightcrawler: The Renaissance of Jake Gyllenhaal continues unabated. After last year’s top-10 lister Prisoners Gyllenhaal returns in this dark comedy about a man with a drive to succeed and an absolute lack of moral inhibitions. Taking the world of 24-hr breaking news cycle and making a social commentary on what drives the people who blur the lines of journalistic ethics to feed the public greed for sensationalized news or perhaps even the paparazzi fueled celeb-obsessed culture of ours. Pride: A quiet and unassuming British movie about the coming together of two opposing factions of the society to achieve a common goal. With the playbill stacked with the who’s who of the British cinema this is a complete treat to watch. Sensitively handling the subject of labor strike and the rise of the gay rights movement and the eventual pride parade, this movie has many high points and many standout stars. This reminded me of the underappreciated The Boat that Rocked/Pirate Radio or maybe that was just because Bill Nighy was in both and I love Bill Nighy! Queen: I know at the outset I said the list was in alphabetical order just so that I don’t have to rank all the movies. But if I were to rank them I am more than certain that Queen would be my 2014 topper. I have not seen a more honest attempt at story telling than this story of a simple girl from Rajauri who gets dumped just before her wedding day and decides to go on her honeymoon by herself, on a journey of discovery and revelations which up to this point were the tightly held domain of male dominated road-trip movies. Kangana Ranaut is spectacular as Rani – the eponymous Queen and with Amit Trivedi’s brilliant music this movie is an instant classic. I cannot wait for what Vikas Bahl has to offer next and I hope he continue to be this honest about his story telling, because the results are fantastic. The Imitation Game: as mentioned earlier it was hard to choose between Haider and this one as both movies had their merits (stand out performances by the leads) and its pitfalls. But when a story this important is being told, it almost doesn’t matter if there are a few minor glitches. Benedict Cumberbatch as Alan Turing is incredible and does well to show the vulnerable side of his (and Turing’s) genius. In that final scene towards the end after undergoing chemical castration, Cumberbatch’s performance breaks my heart and you feel for Turing who suffered such indignation at the hands of the society he gave so much to. X-Men : Days of Future Past: Of all the multi-super hero universes out there ( the avengers, the justice league and the X-men) the X-men feel the most organic, they don’t feel like a money grab where you throw a wide variety of superheroes together in an all-you-can-eat style buffet. With the foundation that was laid with a very strong X-men First Class the return of Bryan Singer at the helm righted the wrong of X-men: The Last Stand by essentially rewriting the timeline and setting it up for future adventures. Having perhaps the best assemblage of young Hollywood talent in form of McAvoy, Fassbender, Lawrence, Hoult I have tremendous faith that the Superhero franchise is far from dead. Bring on the apocalypse I cannot wait! Bang Bang: to take two of the most beautiful human beings ever created and to turn them into absolutely unwatchable crap is the claim to fame for Bang Bang. An official adaptation of Knight and Day, this vapid movie should have never been made. Its stupidity was a new low for Bollywood. Singham Returns: I stayed away from Singham despite people claiming how it was a good-masala-movie with very good acting. But being married to a Kareena-aficionado has its pitfalls. After a surprisingly good Kick my faith in the ability of 100cr movie to be bearable was renewed. But it was dealt a deathly blow with this loud brash and crass attempt at storytelling. Rohit Shetty is the Michael Bay of Bollywood and I am staying as far away from his exploding cars as possible. The Amazing Spider-man 2: I loved Marc Webb’s directorial debut 500 days of summer and I loved the Andrew Garfield as the amazing Spiderman. If you bring these two together and throw in Emma Stone I am bound to be excited. But alas that excitement was misplaced and I no longer look forward to any more spidey adventures. 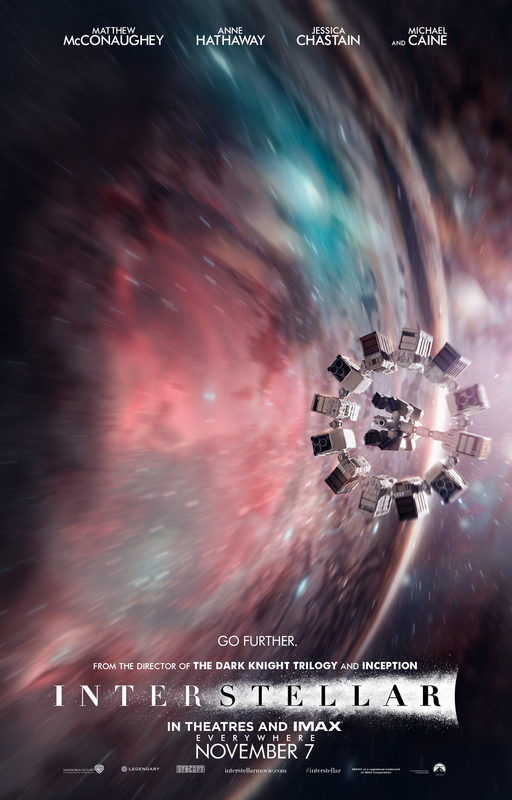 The biggest Disappointment of 2014 was hands down Interstellar. It is not that Interstellar was a particularly bad movie; it’s just that I have come to expect a certain level of intelligence from Nolan and the choice of Matthew McConaughey thoroughly baffled me. While the science in the movie was fascinating and accessible at the same time, the stoner drawl of McConaughey and Hans Zimmer’s obnoxious soundtrack were entirely off-putting. Hopefully, this is only law of averages and Nolan can get back to doing what he does best this will just be something he will look back and laugh while scratching his head thinking what the hell was I smoking when I offered this role to McCoughMyName. There you have it! 2014 all wrapped up with a bow on top. Here’s to 2015 and a wonderful year at the movies. 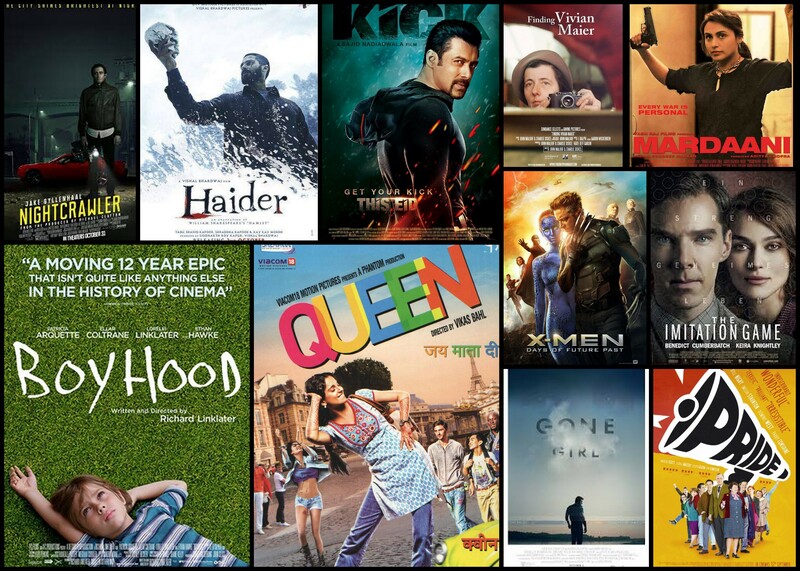 Do write to me and let me know what you think of my assessment of the year 2014 at the movies, if you agree or disagree or have a suggestion for me to watch. I will be back very early on in 2015 with a review of a much-anticipated Birdman and many more exciting movies to come. Happy New Year!